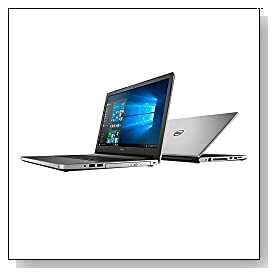 Silver Dell Inspiron i7548-7286SLV is a 15.6 inch touchscreen laptop with up to 8 hours of battery life, a sleek and modern chassis, backlit ergonomic keyboard, advanced 802.11ac WiFi, powerful performance with the fifth generation Intel i7-5500U processor (4M cache) with a benchmark score of 4019 at the moment, generous amounts of high bandwidth 12GB memory for great full multitasking power, 1TB SATA HDD storage at 5400rpm spindle speed and 64-bit Windows 10 operating system. Intel i7-5500U is a decent fifth generation ultra low voltage dual core processor at 2.4GHz speed with Intel Turbo Boost technology which takes the speed up to 3GHz for additional power and speed when needed and with the very large 12GB memory you will be able to have several browsers and programs on screen simultaneously and will all run smoothly. You can store quite a lot of files- songs, photos, videos and regular Word or Excel files on its 1024GB ample hard drive but the speed is the standard 5400rpm for standard read and write times so is not as quick as the 7200rpm drives and is certainly not a Solid State Drive. 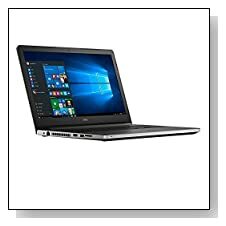 It has enough power to run your multimedia software- photo and video editing and games even though the graphics card is the integrated Intel HD 5500 and lacks a powerful dedicated GPU and you can certainly run the games of 2015 and 2016 games but only at very low settings so this is not a gaming machine and is not priced as such. 15.6 inch LED-backlit Truelife high definition touch display offers very smooth and natural navigation and the regular 1366 x 768 pixel resolution so this is not Full HD with IPS panel for larger viewing angles which we would have liked to see at this medium price level but you are already getting quite good value for your money and you will still have the sharp images and texts and vibrant colours. Sound is quite reasonable- rich and realistic through the integrated speakers and Waves MaxxAudio for when you’re watching movies or listening to music. Dell Inspiron i7548-7286SLV has a good quality high definition webcam for informal and formal chats and taking high resolution photos and the keyboard is backlit for using computer comfortably in the dark or dim light, has a 10-key numeric pad and a touchpad without right and left click buttons. It weighs 4.53 pounds and measures 14.9 x 10.3 x 0.8 inches- slim and lightweight for a touchscreen 15.6 inch computer. You may expect up to impressive 8 hours of battery life from its 3-cell battery for average tasks- movie watching, internet browsing, typing up documents at reduced light settings. There is no built-in Ethernet and no DVD Drive but comes with good connectivity ports such as the fast connection and wide coverage 802.11ac wireless, Bluetooth 4.0 to connect to Bluetooth enabled devices wirelessly, Media Card Reader that supports SD, MMC, SDHC and SDXC formats, a USB 2.0 port, 2 x USB 3.0 ports, an HDMI output and Headphone/microphone combo jack. Although it would have been nice to have a FHD display and SSD for storage or at least a 7200rpm, strong technical specs and other features more than make up for it.